Lush were one of those bands that i enjoyed okay, but never really got into. Or, at least, if anyone asked what i thought of them i would say they were "Cocteau Twins lite". In retrospect, they proved to be the template that Guthrie was to pursue on Violet Indiana, which is to say that they had that same kind of experimental guitar but in a more pop format, with clearer vocals. And, it also turns out that i own all of their records, and that the CDs have survived at least three major move-related CD purges over the years. And i know them and like them, but Lush just isn't one of those bands that i would rave about to people. Some things are like that: competent and even enjoyable, but just not inspiring passion. Lush are like that for me. I appreciate the band, i'm just not very passionate about them. Your mileage may vary, of course. It's been 20 years since Lush released Lovelife, a really good record that seemed to cap off their career. But, like many other old shoegaze acts, the band is back. Well, 3/4 of the band, since their drummer is now deceased. But it still sounds just like Lush. To celebrate their reunion, they released this EP, on lovely 10" vinyl. I ordered it from the band, and it is nicely done. 10" is a pretty rare format, so storing it is a little of a hassle, but it's nice to have on vinyl. The A-side starts with Out of Control, a light pop tune. One guitar whirrs and another strums lethargically. The voice (and i never could tell which of them was singing when) is light, with that very British pronunciation that just seems slightly off to my American ears. But the guitarwork is great, the three of them combining to build a nicely dense tune. Lost Boy rounds out the A-side, a slow rocker with a lot of tremolo on one of the guitars. That gives the song a vaguely upsetting tone, like you are not really sure what you are hearing through the intense wavering. Lush start the B-side with the poppiest tune on the EP, Burnham Beeches. It's got a flat drum beat and guitars that grind nicely, both women in the band do-do-do-ing over a happy rhythm. This is a fun little song. But even with that melancholy ending, i enjoy the EP. 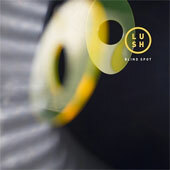 It is a lovely listen and those who have enjoyed Lush in the past will find that this EP picks up right where they left off.